Floor joists sometimes project beyond the foundation wall to provide support for a bay window or additional floor space in the upper rooms. The cantilevered portion of the floor framing should not exceed 16 in. (400 mm) for 2 x 8 in. (38 x 184 mm) joists and 24 in. (600 mm) for larger joists. In either case, this projection should not carry loads from additional floors. 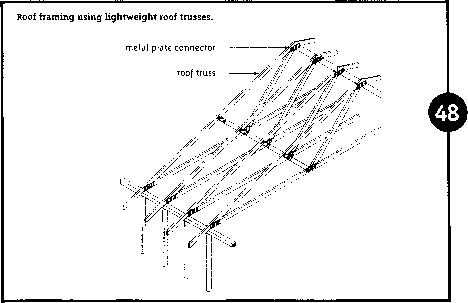 If the cantilevered floor joists are to carry additional loads, they must be specifically designed for the appropriate loads according to accepted engineering practice. The subflooring is carried to and sawn flush with the outer framing members. Figure 41 shows a typical second-storey projection. Insulation should be fitted carefully, and placed on top of the soffit finish under the cantilevered floor and up the inside face of the joist header and end joists. The vapour barrier should be placed on the warm side of the insulation and neatly fitted and fastened in place. If the joist depth is great enough, the space between the insulation and subfloor is usually left open to let the warm air in the ceiling area circulate between the joist spaces. In this way, the floor in the projected area Is heated both from below and above, resulting in an even and comfortable floor temperature throughout the room. To prevent external air infiltration into the cantilevered area, the soffit under the overhang and other parts of the trim should be carefully fitted and caulked where necessary or wrapped with an air barrier.